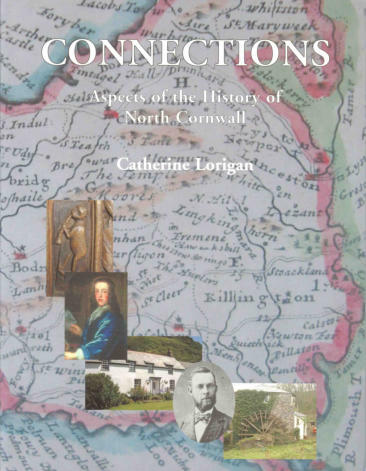 Catherine Lorigan says “While researching the history of Delabole between 1998 and 2004, my attention was diverted on a number of occasions away from my primary purpose. A newspaper article, a site on the worldwide web, a note in a book or a reference to a building, all relating to some aspect of the history of North Cornwall, would catch my interest. Knowing how easy it would be to become distracted, I determinedly put these topics to one side but kept a list of those subjects that looked potentially interesting with the intention of returning to them at a later date. This book is the result. The book is called Connections because the further I delved, the more apparent it became that, entirely unexpectedly, links between the topics and people about whom I was writing abounded and the work quickly became a fascinating voyage of discovery. For example, as will be seen in Chapter Two, Moses Pitt, born in St Teath knew Humphrey Prideaux, son of Edmund Prideaux of Prideaux Place. Prideaux knew Richard Lower, born in St Tudy parish, Richard Lower knew Anthony Wood, Anthony Wood knew Moses Pitt. Family connections were also much in evidence. The Tregian family of Golden Manor was related to the Arundells of Lanherne, the Arundells to the Jernigans and Waldegraves. The Waldegraves were inter-married with the Petres who were patrons of William Byrd who knew the Tregians - and so on. Similarly, Richard Connock whom we meet in Chapter Three was great-great-uncle to both Richard Lower (see above) and Lower’s wife, Elizabeth Billing who were first cousins while a cousin of Humphrey Prideaux’s married Richard and Elizabeth Lower’s daughter, Ann”.